In accordance with their weight-bearing function, the vertebrae become larger toward the lower end of the column, but all are built on the same fundamental plan. A typical vertebra is composed of a body anteriorly and a vertebral arch posteriorly ( Fig. 248-2). 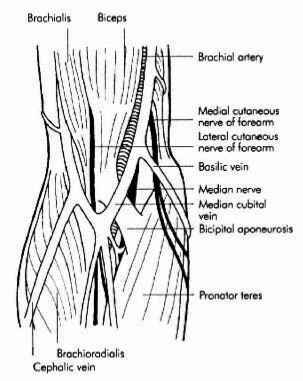 Between the body and arch is the vertebral foramen, through which the spinal cord runs. The vertebral arch is made up of two pedicles, two laminae, and seven processes (one spinous, two transverse, and four articular). The spine has the potential to move in flexion, extension, lateral flexion, rotation, or circumduction (combination of all movements). The articular processes form synovial joints that act as pivots of the spinal column. The orientation of these articular facet joints changes at different levels of the spine. Differences in orientation of the facet joints account for variations in motion of specific regions of the vertebral column. A series of ligaments serve to maintain the alignment of the spinal column. The anterior and posterior longitudinal ligaments run along the vertebral bodies. Surrounding the vertebral arch are the ligamentum flavum and the supraspinous, interspinous, intertransverse, and capsular ligaments. 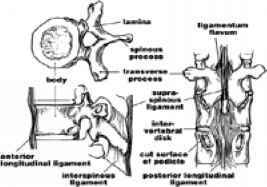 The intervertebral disks lie between adjacent vertebral bodies. Each disk consists of a peripheral annulus fibrosus and a central nucleus pulposus. The annulus fibrosus is composed of fibrocartilage. The nucleus pulposus is a semifluid, gelatinous structure made up of water and cartilage fibers. With advancing age, the proportion of water decreases and fibrocartilage increases. The disks act as shock absorbers to distribute axial load. When compressive forces exceed the absorptive capacity of the disk, the annulus fibrosus ruptures, allowing the nucleus pulposus to protrude into the vertebral canal. This may result in spinal nerve or spinal cord compression. FIG. 248-2. Vertebra. Each vertebra consists of a vertebral body and posterior element. They are stabilized by an anterior lognitudinal ligament, posterior ligament, and interspinous ligament.